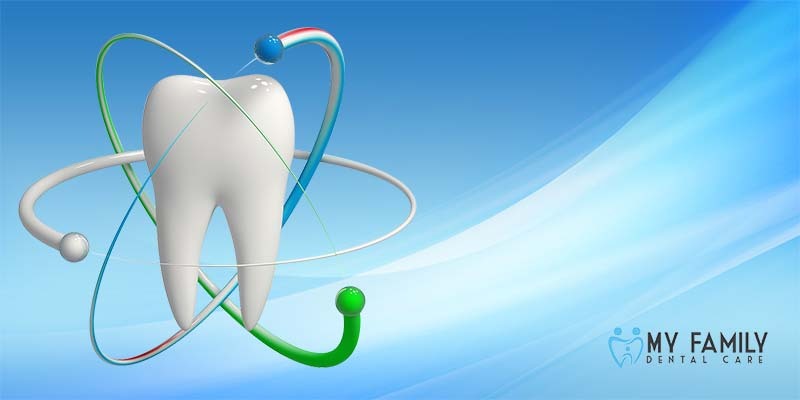 Studies have shown that there is a connection between oral hygiene and overall health. A visit every six months to My Family Dental Care is the best way to prevent excessive plaque buildup that leads to tooth decay and gum disease. Our dentists and dental hygienists will provide you with a professional cleaning that last usually less than one hour. Removing plaque is the most effective way to maintain healthy teeth and gums. Brushing, flossing, and using a mouthwash at least twice daily in addition to regular dental checkups will keep your smile looking its best. My Family Dental Care offers a teeth whitening system that safely lightens stains and gives you a whiter, brighter smile. Our teeth whitening procedure effectively erases stains and brightens your teeth without damaging tooth enamel or gums. We offer a couple of options for teeth whitening, in our office or a personalized at home system. In our office, our professional staff will perform the whitening procedure. It takes about one hour and you’ll be amazed at the results. Our at-home teeth whitening kit is safe and effective. We take an impression of your teeth to create a customized tray. The tray fits firmly over your teeth to achieve optimum results. We’ll routinely monitor the whitening progress ensuring your teeth and gums stay healthy. To learn more about our preventive and cosmetic dental care or to request an appointment, please contact My Family Dental Care by calling our office. You can also sign up on our website to receive more information about the latest in dentistry services that My Family Dental Care has to offer.